1 sheet frozen puff pastry, thawed according to directions on box. In a lg. bowl, toss the sliced apples with the lemon juice until the apples are thoroughly coated. Add the Blackcurrants, 1/4 cup sugar, and the 2 tablespoons cold cubed butter and toss well. Set aside. • Lightly dust the work surface with flour. Lay the puff pastry on top and dust the rolling pin with additional flour. Gently roll the puff pastry to 1/8-inch thickness. • Position the sheet of puff pastry on a parchment lined baking sheet. 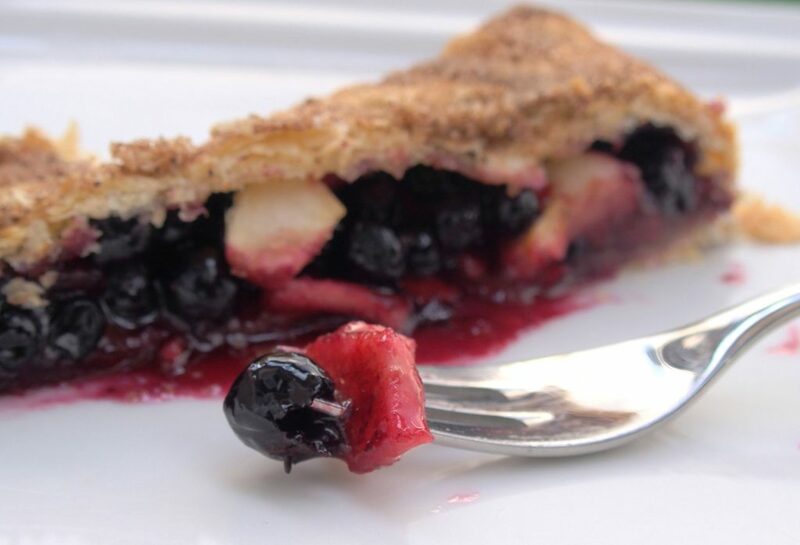 • Spread the Black Currant & apple mixture on top of the oats leaving about 1-inch of space along the side edges. • Sprinkle 2 teaspoons of cinnamon over the mix. • Brush some of the melted butter along the 1” edge of the pastry to help seal. • Fold the other half over the mix and pinch to seal the edges together tightly. • Brush the entire strudel with the melted butter. • Sprinkle with 2 teaspoons of cinnamon and remaining sugar. • Using a sharp knife, make 3 diagonal slits across the top of the strudel. • Bake for 40 minutes, rotating halfway through cooking, until the pastry is puffed and golden brown.